La Sardane is a LUX-camp located in Argelès sur Mer, an area enjoying warm climes from early spring to late autumn. Just 300 metres from the beach and 200 metres from the town centre, the holiday camping site boasts more facilities for leisure, relaxation and fun-packed family holidays than anyone could possibly explore in a week's stay! Why should I camp at La Sardane? Why visit the Languedoc-Roussillon and Perpignan Regions? 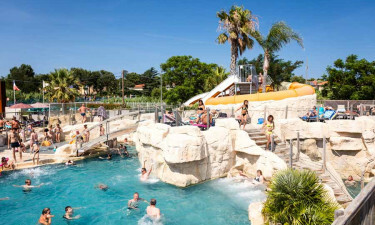 An ideal base for exploring France's glorious Languedoc-Roussillon and Perpignan regions, Camping La Sardane is a luxury camping site where adults, teenagers and children can enjoy their camping holiday in a safe environment with easy access to both beach and the Pyrenees-Orientales. Day excursions to historic towns, villages and cities this part of France is so justly famous for provide an ideal contrast to the onsite leisure activities and offer nightlife and shopping within a short drive. What other luxury camping experiences can guests look forward to? Starting with the Fitness centre, campers can enjoy a great workout before breakfast, or go swimming in the fabulous pool area, before trying their hand at archery or climbing or joining boules competitions, sports tournaments, playing volleyball, football or table tennis. Kids have their own mini-club and play area, little shows and performances, treasure hunts and drawing competitions to look forward to. And if that sounds too much hard work, there is relaxation at the nail bar or the beauty centre, the massage-modelling salon or simply sitting in a deckchair by one's very own leafy pitch and listening to bird-song! Campers can enjoy evenings out at La Sardane's own pizzeria and snack bar, although the town centre is within skipping distance, should little diners have a hankering for burgers and chips! La Sardane offers guests a wonderful blend of dance nights, shows, pub quizzes, bingo and other nightlife entertainments that don't require transport by car - it's all right there onsite within an easy stroll of their mobile home! Oh, and there is also that fully stocked piano bar overlooking the pool mentioned earlier and a wine cellar and takeaway meal service. The luxury holiday camping site boasts its own gift shop and supermarket for daily groceries like fresh bread and is within a short walk of more shopping facilities in the town centre. 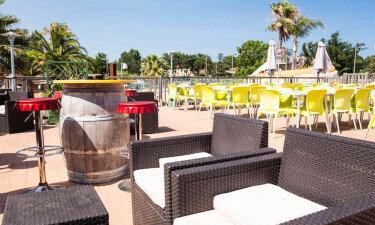 If you've been looking for luxury camping where dinner shows, cabaret evenings and children's Olympics are part-and-parcel of the holiday experience, then La Sardane is right for you. 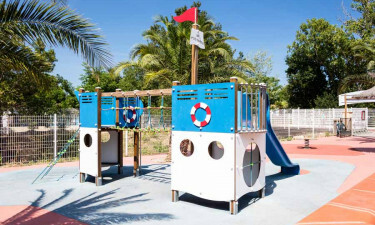 Set in stunning surroundings, this French Lux-camp in the Languedoc-Roussillon and Perpignan region has it all and more! Perhaps La Sardane's team of luxury camping experts will welcome you and your family next year?